I”m at home wrapped up in a blanket in a little ball of self-pity, feeling thoroughly rotten with my immune system fighting off something horrible. I’ve been trying to decide if I have the energy to watch Chronicle or not for the last 30mins, then and decided to delay my decision by wasting a little more time catching up on the latest news around the world. I was really happy to find that an official teaser trailer for the latest James Bond film, Skyfall, has been released and is being received with glee. This 23rd Bond film has been dogged by problems, with production coming to a halt in 2010 when MGM, the films distributor, hit financial problems. Thankfully MGM came out of its red spell in December 2010, and in January 2012 we were given a release date for November 2012. 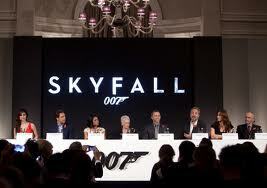 The brief plot synopsis we’ve been given is, “James Bond’s loyalty to M is challenged over secrets from her past. When MI6 is attacked, it falls to Bond to seek out and eliminate the threat regardless of the cost to himself,” and along with regulars Daniel Craig and Dame Judi Dench, it’s been confirmed that Javier Bardem (as the main villain Raoul Silva), Ralph Fiennes (as possible current or ex government agent Gareth Mallory), Naomie Harris (as field agent Eve), Bérénice Marlohe (as Bond girl Sévérine), Albert Finney (as Kincade), Rory Kinnear (as Bill Tanner, the MI6 Chief of Staff), Ben Whishaw (as Q, making a surprising appearance after being excluded from Casino Royale and The Quantum of Solace), Helen McCrory (as politician Clair Dowar) and others. The interrogator/psychiatrist then says, “Skyfall,” and we cut to a close-up of Bond’s face inter spaced with what appears to be a flashback scene of a man holding a gun standing over another man slumped (shot or dead?) in an armchair, cutting back to Bond’s face and then to Judi Dench (M), Ralph Fiennes (Gareth Mallory) and another agent watching the scene intently from behind the one-way glass, with Mallory turning his head sideways to view an impassive M. The man prompts Bond by repeating, “Skyfall,” and Bond snarls back, “Done,” and gets up and leaves the room, shooting a glare at the one-way glass as he does so. The trailer then ups the tempo with a collection of dramatic shots of the Shanghai skyline at night, a beautiful women standing in a blown-out window, Bond shooting his gun, a row of coffins draped with the British flag, Bond running down a London road, helicopters, more shooting and men running and falling, M with Bond (?) viewed from behind surveying a mist-strewn valley, a ‘Not in Service’ London tube train crashing through a wall, a man (Raoul Silva?) walking towards camera with a burning building behind him, the logo for Skyfall with Bond’s voiceover saying, “Some men are coming to kill us…” interspaced with Bond clearly preparing himself for battle, then cutting to Bond continuing to someone off-camera, “We’re going to kill them first,” and lots more exciting action scenes with things exploding (including a poor, defenceless silver Volkswagen), men fighting underwater and more booming, banging, shooting scenes. Don’t pretend you’re not excited, this is going to be great. I was a huge convert to the revamped James Bond when it launched in cinemas with a refreshing lack of camp, cheesy one-liners, and ridiculously unbelievable gadgets. I embraced the new craggy-faced and blonde Bond over the slightly sickly-smooth brunette Bond’s that had come before him. Daniel Craig delivered, and although the revamp was heavy on the product placements like most of the Bond films that had preceded it, it was clearly heavily influenced by grittier action films like the Bourne franchise, and it was obvious that they were trying to return to the original Bond as envisioned in Ian Fleming’s original novels: more action, more spying activity, less CGI. I’ve now used up more than enough time transcribing the Skyfall trailer into words, instead of just posting a link to the official trailer site with the command to Watch This Now, and am going to go and slurp some soup, rearrange my blanket nest and try to fall asleep to something a little more soothing than Chronicle. Sweet dreams all.